In the early hours of Thursday morning, the marine vessel — the Valkoista — arrived at the Port of Geraldton on the coast of Western Australia. On board, it was allegedly carrying 1.2 tons of methamphetamine which were unloaded in bag form into a waiting white hire van. As the van backed out from the dock, waiting police pounced into action. Tactical response police officers arrested three men in the van: a 33-year-old man from southern Sydney and two men from the state of New South Wales (NSW), aged 38 and 52. The 59 bags each containing around 20 kilograms of methamphetamine — commonly known as “ice” — were seized from the vehicle. 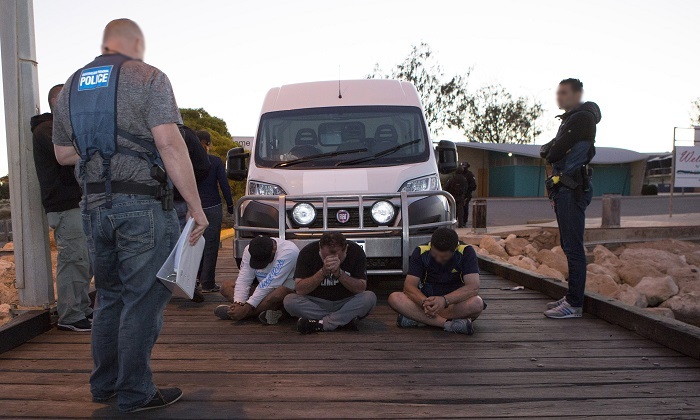 More police arrested another three men on the vessel: a 45-year-old man from the NSW Central Coast and two men from South Australia, aged 48 and 44. Another bag of methamphetamine was found on the vessel. Police say that the drugs have an estimated street value of A$1.04 billion (US$771 million). ABC reported that the drugs originated from China and had been brought to Australian waters via a ‘mothership’ anchored offshore. “It is the largest meth bust in Australia’s history, topping an unrelated 903-kilogram seizure in Melbourne in the first quarter of 2017. It is the largest ever drug seizure in Western Australia,” said a statement put out by the Australian Federal Police (AFP). Police also arrested two men from South Australia, both aged 37, at a hotel in Perth for their alleged involvement in this drug importation, said the statement. Search warrants were also conducted at residential properties in Sydney, the NSW Central Coast, and Adelaide. The operation was a multi-agency investigation which traversed the country. They had been working in close partnership since July to dismantle a drug trafficking network which is believed to be based in Australia. AFP Deputy Commissioner Operations Leanne Close said police were continuing to gather and evaluate evidence. “[The investigators] have been working around the clock in the lead-up to Christmas to disrupt this record importation,” Close said. “The AFP will allege in court these men intended to distribute the drugs along the east coast of Australia,” she said. Australian Border Force regional commander for Western Australia Rod O’Donnell said the country’s maritime border is vast. The ABC reported that based on the National Wastewater Drug Monitoring results released last week, the volume of the seize is enough to supply the meth habits of the entire country for two months.